The idea of ‘flossing’ is to slide the sciatic nerve back and forth through the space where impingement occurs. This ‘flossing’ facilitates the gradual release of the nerve to once again move more easily. 1. Start in a seated position with your legs able to swing freely. 2. 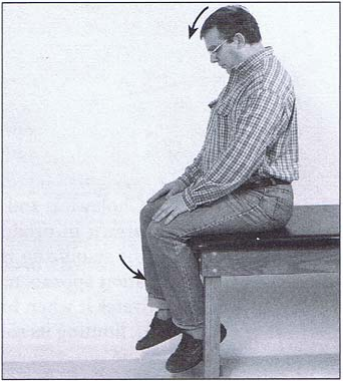 Simultaneously bring your chin to your chest and further bend your knee (figure 1). 3. 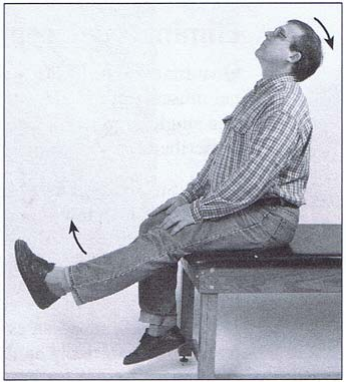 Then simultaneously tip your head back and straighten your leg (figure 2). 4. Repeat 10 times in a slow and coordinated motion with each cycle lasting about 5 seconds. Then repeat on the other side. NOTE– If you experience minor sciatic symptoms when flossing, then make the movements smaller until no pain is provoked. If symptoms worsen then you are not ready to “floss”. Do not perform flossing within 2 hours after rising from bed.